because we cut down much more than we re-plant, original forests are disappearing. We risk only having 10% left by 2030 if we don’t make some serious changes. 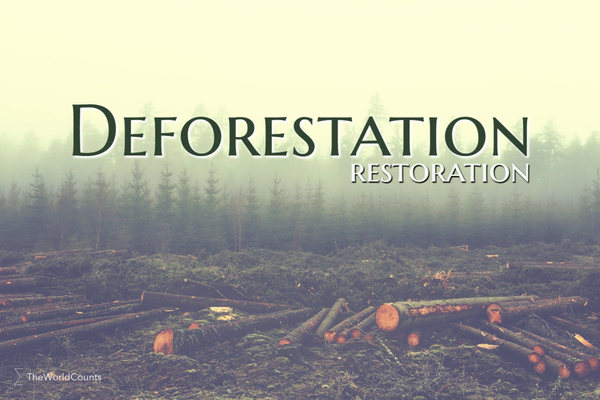 Around 50 percent of the planet's wild forests are gone. If the trend continues, we will only have 10 percent left by 2030. Entire forest system have disappeared in at least 25 countries and have declined by 90 percent in another 29 countries. This destruction continues at staggering rates. Today, about 10 percent of the world’s forests are protected areas. This is 3,600,000 square kilometers, or what would corresponds to an area somewhat larger than than India. Countries are increasing their efforts in conserving forests, increasing the area by 32 percent from 1990 to 2005 - nearly twice the area of Spain. More than 100 countries have established national forest programs to manage forests more holistically. Global deforestation sharply accelerated around 1852. It has been estimated that about half of the Earth's mature tropical forests—between that until 1947 covered the planet have now been cleared. Some scientists have predicted that unless significant measures (such as seeking out and protecting old growth forests that have not been disturbed) are taken on a worldwide basis, by 2030 there will only be ten percent remaining, with another ten percent in a degraded condition. Interested in more facts like the wild forests left? Then plug in and subscribe to our newsletter.